On Feb 4th year of our lord 2013 the King Yugo gave royal assent to the Union Act between the Kingdoms of Battkhortostan and Montequercus whereas Montequercus would join Battkhortostan in return for Defense of it's territory in light of current unrest to the east, as well as to defend from possible attempts by the balkanized Breshikan states to anull the December 13th Agreement between Montequercus and Kingdom of Avence granting Montequercus independance. After formalizing the union, Montequercus promptly applied for financial and development aid it's entitled to in the Battkhortistan budget, which has caused Battkhortostan a several million Iron deficit. On February 5th the Kingdom of Avence revolked the December 13th agreeement, leading to Montequercus to request Battkhorti Military assistance to defend New Virginia against any possible Breshikian agression. 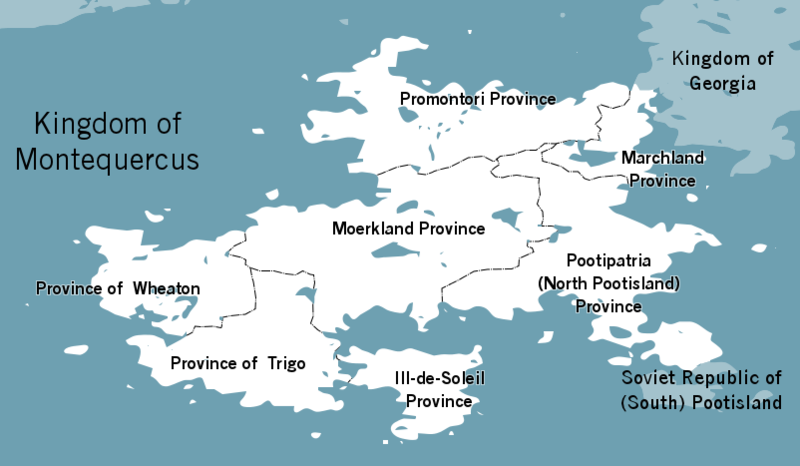 It was discovered on Feb 6th that in violation of the December 13th Agreement Breshikian Field Marshall Rebelbaron landed an Avencian military force on Promontori and started to dig in and build fortifications, leading to an Emergency declaration of State of Direct War Threat in the Kingdom, and Martial Law and in Promontori and Marchland in face of Breshikian Military agression.